Once you decide to have a pet Yorkie, the “shedding” question instantly comes to your mind. 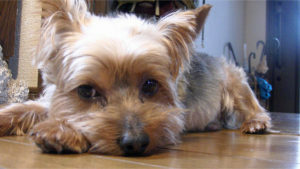 We all know that every dog sheds, except the hairless breeds, then why not Yorkie? Actually, Yorkies do not have fur, but they have hair. That does not mean that they do not shed, but yes, of course, lesser as compared to other dogs with fur. As already mentioned, there are differences between other dog’s fur and Yorkie’s hair. The differences are of texture, thickness and the speed of growth. Yorkie’s hair is more relatable to human hair. The other dog’s fur grows in stages, however, Yorkie’s hair continues to grow throughout the year. (similar to human hair) Hair fall does occur, due to the certain changes in climate. Yes! Yorkies do shed, but it is less noticeable, as it happens slowly all around the year. Unlike other dogs, you will not find so many Yorkie’s hairs in your house as they are thinner and fall back on its own body. Having Yorkie’s hair on the brush is quite normal and points that you have done the brushing process rightly. It is perfectly normal for a pregnant Yorkie to shed more. You should not worry about that! Tip to avoid hair loss of your cute Yorkie! Apply leave-in conditioner. It will repair the damage caused by climate change, but of course, do not opt for human hair products. Use specialized conditioner for this purpose. When to worry about your Yorkie’s shedding? This can be due to any human or substandard product used on Yorkie or just due to flea bites. A Yorkie can face hair loss due to hormonal imbalance like a normal woman, especially during pregnancy. They are not only a threat to Yorkie’s hair but also to its health. So, hurry to a vet and do not postpone eliminating them. There are certain diseases which cause abnormal hair loss. This must be kept under consideration that Yorkies do not shed like other dog breeds, but still, it can be a danger for people having allergies from dog’s fur. So, no dog is 100% hypoallergenic.